Web LinksMy drawingsMember DetailsAs a child, Aga Grandowicz always wanted to be a vet or an ichthyologist (a scientist who studies fish), but changed her plans one year before college and became an award-winning art director and visual designer instead. She’s the owner of a boutique graphic design agency in Dublin (agrand.ie) helping various businesses communicate their offerings. Aga specialises in designing corporate identity and theatre posters. Outside of work, she switches off and escapes by drawing furry animals and old trees. 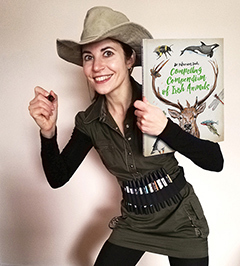 Her first book about animals – ‘Dr Hibernica Finch’s Compelling Compendium of Irish Animals’, published in October 2018 by Little Island, has been shortlisted for the Irish Book Awards 2018.